So I need to apologize for my last article. I did something I get mad at my students for I mail it in, I half assed it, I didn’t put in the full effort and create something to be proud of. As a reader of this distinguished site, I owe you an apology. I am sorry. I will try my best to make sure this does not happen again. Therefore, I am going to be rolling out a series, called The X (The Ten). This series is going to combine two things that I like; lists and Star Wars. I will create lists of the ten best or worst subjects of Star Wars. 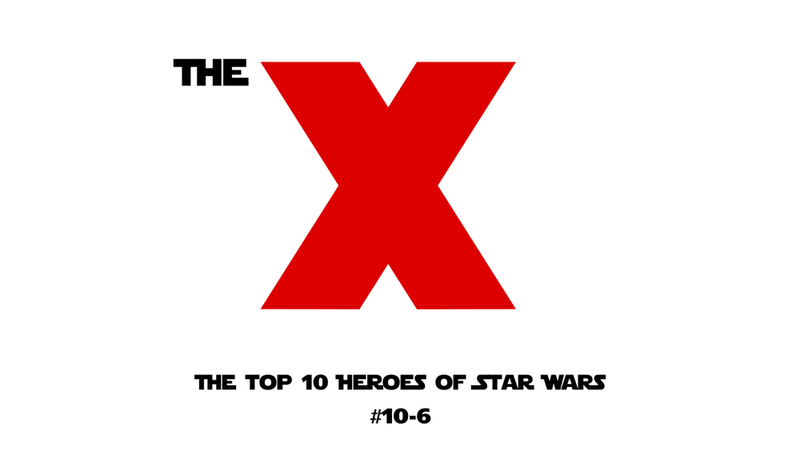 For the first one, I will go more in-depth with who I think are the 10 best heroes in the Star Wars Universe, including the extended universe (Legends). Let’s start with numbers 10 through 6. The next article will focus on 5 through 1. After that, I will dive in with a deeper look into each character. Before we get into the list, I am going to try to define what I believe a hero is. According to Dictionary.com, a hero is defined as, a person noted for courageous acts of nobility of character or; a person who, in the opinion of others, has special achievements, abilities, or personal qualities and is regarded as a role model or ideal. Interestingly the third definition was “the principal male character…” I want to come up with my own definition instead of relying on simply a male character with morals. A hero is someone with character who is able to overcome long odds. While I know this definition can be torn down pretty quickly... this is my article and I can do whatever I want. I acknowledge that there are more than 10 heroes out there. I am trying to not focus on just Jedi, these are heroes over all. Maybe I will write a list of 10 Jedi and 10 Sith later…. Quick thoughts: Mara Jade is a character from the extended universe pre The Force Awakens. She is force sensitive with a great back story. I have only read 4 or 5 books with her as a character and she is one of my favorites. If you don’t know who she is, you need to pick up one of the old novels. Quick thoughts: Wedge is one of the key minor characters from the original trilogy who had a hand in destroying both Death Stars. He ends up rising to being the leader of Rogue Squadron. He also has a role to play in a few other books besides being in the movies. Quick thoughts: Poe Dameron is not liked by multiple people on our staff here, but I am a fan of Poe. He is trusted by General Organa to go on a special mission to find the map of the last Jedi. That is pretty important. Quick thoughts: Finn is one of the heroes of The Force Awakens. He ends up running away because he is against what the New Order is doing but gets involved with the Resistance and is able to help rescue Rey (kinda). Quick thoughts: Yoda has trained the majority of the Jedi in the galaxy during his time with the old republic. He trained Count Doku, mentored numerous Jedi, and trained Luke Skywalker. While he would be higher, Yoda didn’t realize who Darth Sidious was when he was in front of him the entire time. Next time will be 5 through 1!